Border history may well have been dominated by the political struggle between England and Scotland, but it would be wrong to assume that the story of the Borderland was always a saga of Englishman against Scot and vice versa. 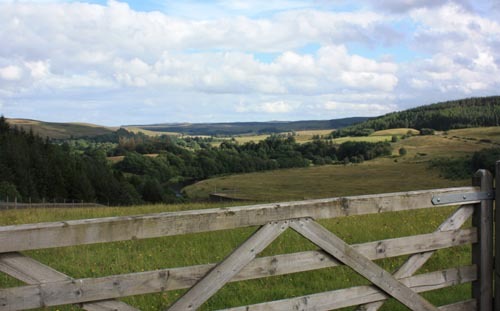 In Tudor and Elizabethan times the Anglo-Scottish Border counties, including Northumberland, were the home to the notorious Border Reivers, the lawless clans of the border valleys, where a lifestyle of raiding and marauding was the only way to survive. The life of the Border Reiver was not necessarily ruled by his allegiance to the English or Scottish Crowns, but more likely by his allegiance to a family surname. Feuds were often fought and raids were made, not in the name of England or Scotland, but in the names of Armstrong, Robson, Charlton, Elliott or Dodd, or in the names of other Border surnames, that are still common in the region today. Indeed it was a common occurrence for English families to side with Scottish families in border feuds, especially as some of the reiver surnames, like Armstrong, Hall and Graham were to be found on both sides of the border. ‘The neist time gentlemen cam to tak their schepe They are no te’ be scabbit! Such tales as this were typical of the Border Country many centuries ago, though it is not always easy to separate the fact from the fiction, since these stories were often constructed by people who had never even visited the borderlands. Border Reivers and their way of life, were certainly feared by outsiders in days gone by and the Border Country had a certain element of mystique and danger about it. Even in the nearby walled town of Newcastle upon Tyne, there were rules forbidding the apprenticeship of North Tynedale and Redesdale men to certain Newcastle trades, for fear that there might be trouble. As stability, Law and order were brought to the Border region following the accession of James I to the throne in 1603, the activities of the Border Reivers gradually came to an end. Some of the most troublesome reivers were transported to Northern Ireland but many of the reiver’s descendants became keelmen on Tyneside, or Northumberland and Durham pitmen. Some emigrated to Australia and America and of course the first man on the moon was an Armstrong, descended from the Border Reivers of that name. The legacy of the Border Reivers is not just in the surnames found throughout the English-speaking world but also in their ballads and in two notable phrases that have entered the English language via the Border Reivers: Blackmail and Red-Handed. In Tudor times ‘mail’ was an old word for ‘tax’ or ‘rent’ in the Border Country and farmers in the region often paid rent to their landlords in the form of silver money which was known as ‘White Mail’. When they couldn’t pay in silver, payment was made in goods such as cattle or other livestock that was often of much higher value than the rent they would have paid in silver. It was the enforcement of paying in goods of a higher value that came to be known as ‘black mail’ (black rent). Later, the reiver gangs on the Borders began extorting from farmers for protection money and this extortion was also known as ‘blackmail’. Such a criminal culture survived because of the difficulties of keeping law and order in the Borders. Over time the term blackmail developed into a term for different kinds of bribery. Another phrase that may have its roots in the Borders and shared with Scotland too is ‘red-handed’ which literally means being caught with blood on your hands either in the slaughter of an individual or taking of livestock. The phrase is sometimes associated with Northern Ireland and the flag of Ulster features a red hand but the phrase was imported there from Scotland. In the Borders, robbers who were caught in the act of stealing were ‘caught red-hand’ and often executed on the spot. The Border Reivers, or at least those on the north side of the border are sometimes considered to be just another group of otlying Highland Scottish clans and that those on the south side are simply clans who have spilled over into England. In reality the Border Reivers formed a distinct group with few links to the Scottish Highland tribes to the far north. The surnames of the Border Reivers on both sides of the border certainly seem more English or Anglo-Saxon in style. Unlike most of the famous clans of the Scottish Highlands, they all lack that Celtic element ‘mac’, (the Gaelic word meaning ‘son of’), which occurs in names like McDonald and McDougal. It therefore seems probable that the Border Reivers on both sides of the border were largely and at least in lingusitic terms Anglo-Saxon by origin with a bit of Norse and Celtic thrown in. 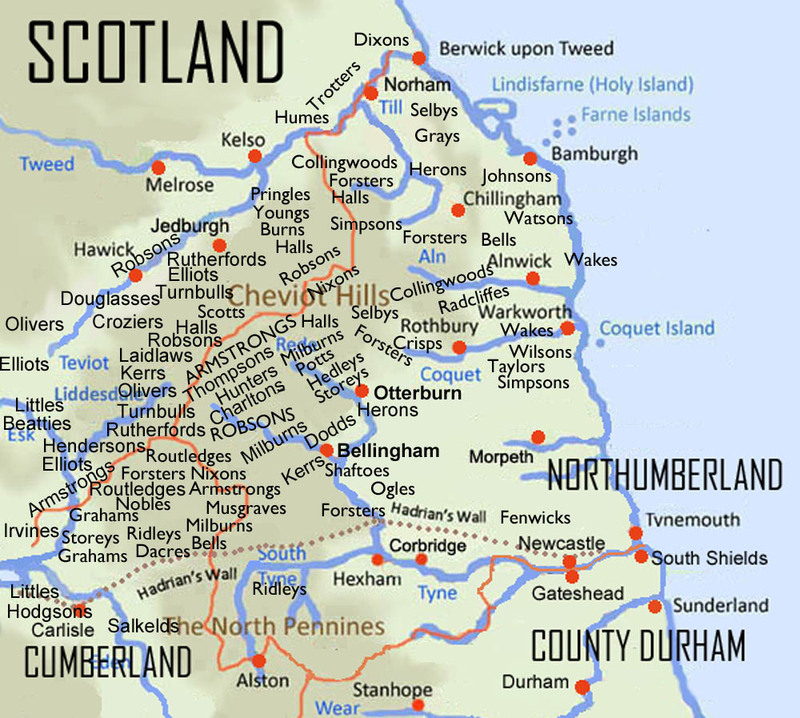 This has a simple explanation; the boundaries of the old Anglo-Saxon kingdom of Northumbria, stretched far to the north of the modern Scottish border, towards Edinburgh and the Lothians and its people spoke the Anglo-Saxon language known as Northumbrian. The Border Reivers way of life does bear remarkable similarities with both the early Celtic inhabitants of Britain and the Anglo-Saxon and Norse warriors who later settled here from their homelands in northern Germany and Denmark in the 6th century A.D.
Who broke my bower and slew my knight. And left me in extremity. Nae living creature came that way. And covered him with grass sae green. Many of the Border Ballads still survive today, due to the avid collecting of the famous Border poet, Sir Walter Scott (1771-1832), himself the descendant of a famous border clan. It’s noticeable that there seem to have been quite a few famous footballers with Border Reiver names over the years. This is perhaps no coincidence. The ‘freebooting’ Borderers who roamed the Border in Tudor times loved football and matches were played with great vigour, violence and enthusiasm. Some well-known footballers of more recent times like Ashington’s famous footballing sons (Jack Charlton, Bobby Charlton and Jackie Milburn) may be descended from the Milburns and Charltons who once inhabited North Tynedale, where they lived in close proximity to the Dodds and Robsons. Together these families were known as the four graynes or clans of North Tynedale. The Milburns were perhaps the least known of the four but played their part in many a border raid often siding with the Charltons and Dodds on their regular forays into Scotland. Charlton, Milburn and Robson are famous footballing names of the 20th Century and it is worth noting that football was a very popular sport among the reivers in early times. In 1599 a six-a-side football match involving the Armstrongs at Bewcastle (just over in Cumbria) was interrupted by an enemy raid. A member of the Ridley clan had his throat cut and a Robson was killed. 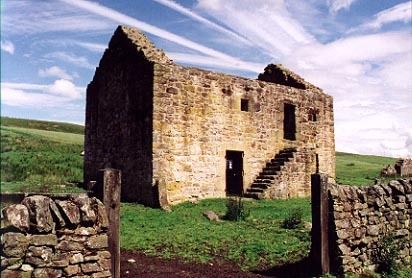 In 1790 a great football match took place between the the men of Tynedale and Redesdale at Kielder Castle. Final score: Tynedale 3 Redesdale 2. It is not known who was in the team that day. This was about a century after the days of reiving had ended but since Tynedale was the traditional home of the Charltons, Milburns and Robsons there were probably some reasonably good players in the team. In those days football probably had very few rules and resembled rugby as much it did association football. Rugby and football are still, of course, popular sports in the Border country today. Maxwell, Medford, Middlemass, Milburn, Mitford, Moffat, Musgrave, Nixon, Noble, Ogle, Oliver, Potts, Pringle, Radcliffe, Reed, Ridley, Robson, Routledge, Rowell, Rutherford, Salkeld, Scott, Selby, Shaftoe, Simpson, Stamper, Stapleton, Stokoe, Storey, Tailor, Tait, Thompson, Thomson, Trotter, Turnbull, Turner, Wake, Wilkinson, Wilson, Witherington, Yarrow, Young.